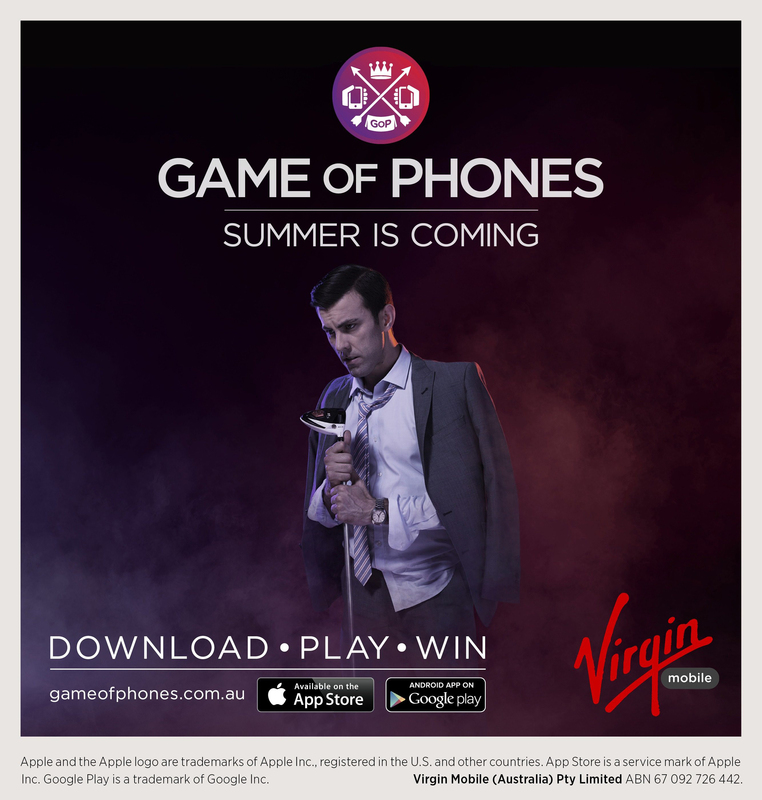 Virgin Mobile Australia has launched “Game of Phones”, an integrated brand campaign bringing a range of rewards worth fighting for to people’s pockets. Players will be challenged to hunt for almost $200,000 worth of prizes in the ‘Game of Phones’ virtual world through a mobile app game that will see live interaction between tens of thousands of people on the streets of Australia. The ultimate winner will be rewarded with a $50,000 VIP voyage of royal proportions, and the grand title of ‘The King’ of ‘Game of Phones’. The winner will have the entire Virgin Family at their disposal to help create their dream escape. The game is not endorsed or affiliated with the HBO TV series Game of Thrones, but players are encouraged to be as cunning and treacherous as its characters. 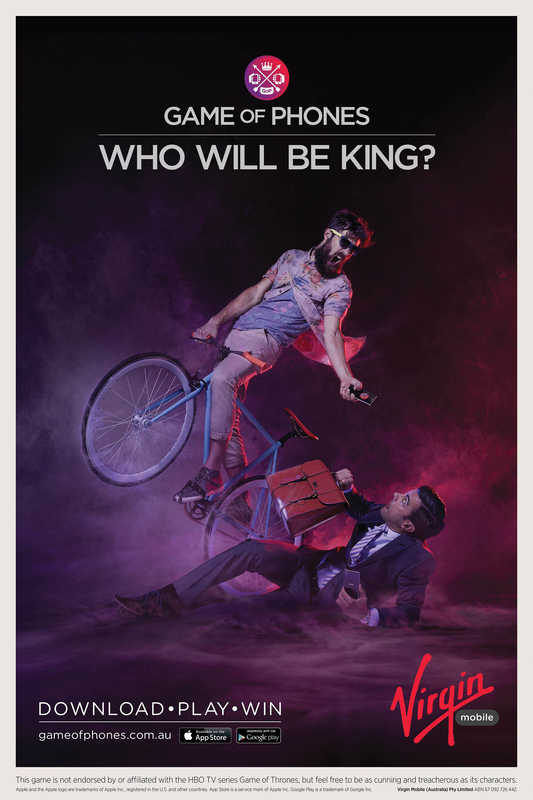 The campaign launches via an irreverent branded content video that captures the spirit of the game and, introduces possible scenarios where hipsters slay accountants, vegetarians ambush butchers and daddy’s little princesses cross their BFF in order to stake their claim on a prize. Virgin Mobile has cast one of Australia’s biggest YouTube stars, beauty vlogger Chloe Morello, in the ‘BFF’ role. Media support at launch includes major national outdoor, digital, display, pre-roll video, rich mobile executions, premium Facebook advertising and commuter press. Virgin Mobile has also partnered with Southern Cross Austereo’s national Today Network which will be amplifying gameplay with live daily updates, talent integration and utilising street teams nationally with promotion across thenetwork’s digital, social and radio platforms. Outdoor media company oOh! Media have built a bespoke dynamic messaging platform that enables Virgin Mobile to control messaging in real time to any individual, or all sites on their digital network. Not only a unique way to enhance gameplay, it’s also a world leading technology execution that brings digital outdoor a huge leap closer to the capabilities of online media. Together with the Southern Cross Austereo partnership, this enables live dynamic messaging to work together for the first time, in real-time across Radio, Online and now also OOH media. “As Virgin Mobile continues to implement its new, customer-centric strategy, it’s paramount that we place our customers at the heart of everything we do. Game of Phones provides a great opportunity for us to do just this, continuing to highlight all the perks on offer that show how we look after our own, while offering Virgin Mobile customers so much more with an incredible prize pool,” Bardsley said. Players will be challenged to hunt for virtual prizes found on the Game Of Phones’ app map screen on their Android or iOS smartphone. When players come within 50 metres of a prize icon, they can tap to claim it, but it can then be stolen by other players located within 100 metres – game on! Throughout the game, Virgin Mobile stores will act as safe houses and game play is live between 7am and 7pm AEDT Monday to Friday and 9am to 6pm AEDT on the weekend from Monday 18 November through to Sunday 8 December. Contestants will be able to retain a maximum of three prizes at any one time, from Virgin Australia Velocity points, Virgin Money EFTPOS gift cards, a Virgin Mobile Irresistible Plan and Virgin Wine mixed cases to Sony Xperia™Z1 mobile handsets, Sony 32” TVs and Nespresso coffee machines. Prizes that have been protected and retained when the game closes will be available to redeem with the ultimatewinner crowned The King and rewarded with a $50,000 Virgin Mobile trip of alifetime. The Game of Phones campaign was developed at Havas Worldwide Australia (Above the Line, Digital Advertising Development) and One Green Bean (Concept creation, app management, PR and social media). Media was handled at Starcom. The app was designed and developed at Locatrix. Filming was shot by director Scott Otto Anderson via Photoplay Films. Photography was by Sean Izzard, and produced at The Pool Collective and Cream Studios.